Disappointed last night by something calling itself a Scotch ale, tonight – an impossibly cold and rainy night – I reached deep into the magic fridge and hoped I would have better luck. And struck black gold in the form of a bottle of beer from Southern Tier Brewing of Lakewood, N.Y. 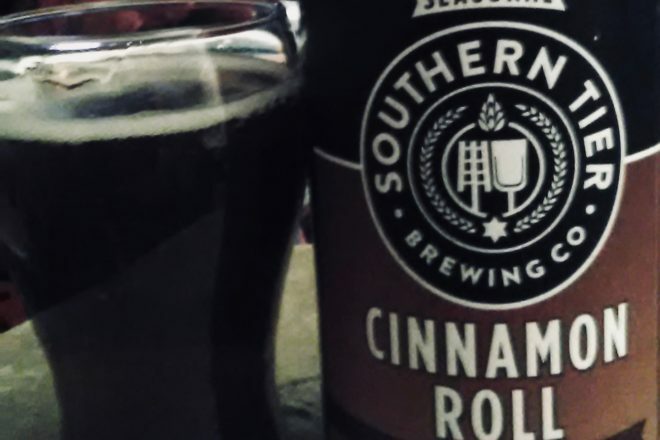 This is a brewery that has yet to disappoint, and after being sadly disappointed by the Scotch ale, I was absolutely ready to tuck into this seasonal Cinnamon Roll Imperial Ale, brewed with cinnamon and caramel. My taste buds were craving a sweet, malty beer after the Scotch ale fiasco, and here it was, an 8.6 percent liquid cinnamon roll. And, yes, it does taste just like a big, fat cinnamon roll. Funny thing is, I don’t eat things such as cinnamon rolls any more. Beer has been my only form of carb intake for the past 18 months or so, and not so much of that as I used to either. So what a treat this liquid cinnabun is. Just as if you were biting into a big sticky bun with gooey vanilla frosting and cinnamon. Even the breadiness is there. But guess what? Halfway through the 12-ounce bottle and I am full to the gills, as if I have just gorged on a big plate of fresh-from-the-oven cinnamon rolls. And now all I can taste is the sweetness and cinnamon. The base brown ale – I assume that’s what lies underneath it all – has disappeared and I feel like I’ve made a pig of myself. My lips are practically stuck together. My belly has extended. I feel a sugar rush. What have I done! Yes, this is a beer that needs to be shared because one sip too much and you feel like you have overindulged. Let loose in the bakery, you’ve eaten everything in sight. 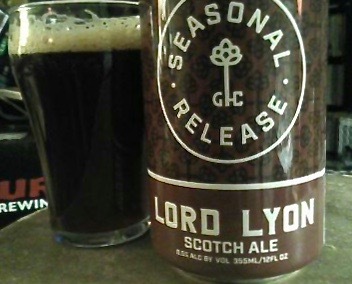 After a long day on deadline, my mind was thinking of getting home to a can of Lord Lyon, a Scotch ale from Good City Brewing Co. of Milwaukee. I love me a good Scotch ale – also known as a “wee heavy” – because it’s all about the sweet, malty goodness. I couldn’t wait to dive in deep. But, man, this one isn’t doing it for me. I expect a Scotch ale to be thick and on the sweet side from plenty of caramelly malt, but this one has an added ingredient that gives it a sharp taste. They’ve used something that makes the taste too intense for what I know as a Scotch ale, which annoys the hell out of me when I had it on my brain all day. I can’t quite identify what is wrong with it. A surfeit of hops? Too much dark malt? When I drink a Scotch ale, I expect the sweet caramel, toffee notes to dominate, not the bitter-smoke thing that rules the Lord Lyon’s flavor profile. Peat smoke flavors are for Scotch whiskies from the island of Islay, not true Scotch ales. That, I believe, is an American craft brewer invention. It’s a sticky 8.5 percent beer that I wish I could love, but, no, sorry Lord Lyon, you have missed the mark for me.